A couple have been left angered and humiliated after a photographer photoshopped their engagement photos. 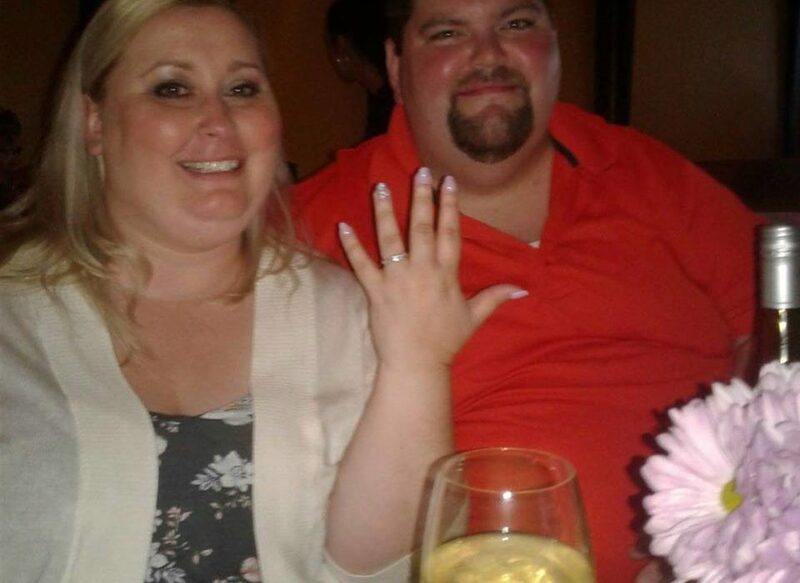 Katie Liepold from Ohio hired Lina Silvestri from Tower Photography in Medina, Ohio, for her upcoming wedding with a $600 package including a series of engagement photos. Everything seemed fine with the shoot but when Katie and her fiancé Jon Kistler received the photos they were less than happy. Katie noticed a series of problems including blurry images, bad lighting and weird angles in the shots. 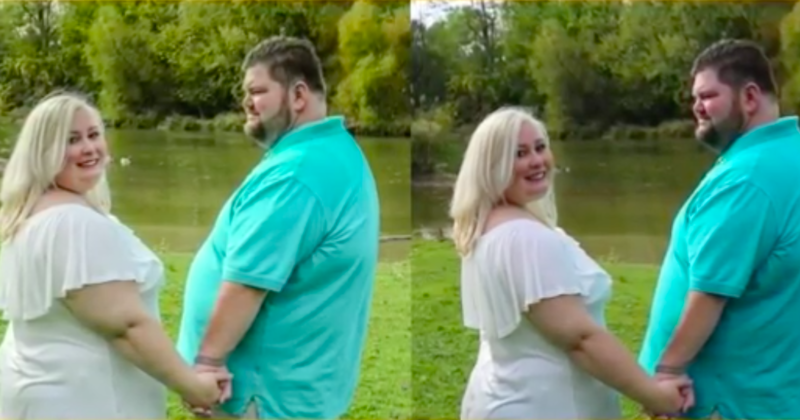 But what really caught her and Jon’s attention was that one of the photos had been photoshopped to make her and her fiancé appear to be 30-pounds thinner each. We didn’t really need the engagement session, but it was in the package so we did it. We laughed, we talked, we joked, we shared stories. This isn’t exactly what I thought I was going to get. She actually photoshopped one picture of us skinnier. That wasn’t asked for, and I just felt like that was really hurtful and my pictures weren’t good enough to be left alone. Katie contacted Silvestri to share her concerns and the photographer responded saying that the couple could cancel the contract. However, Silvestri added that she would keep the $150 deposit to cover the time spent shooting the couple for their engagement photos. 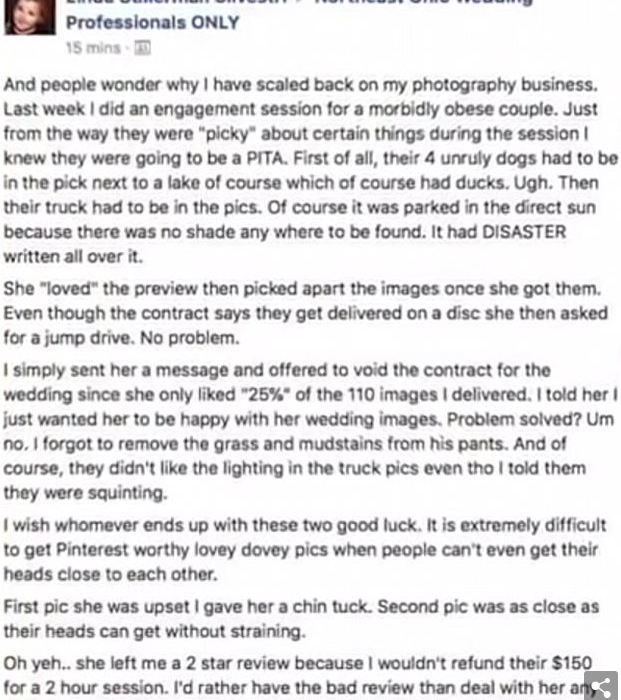 Things got worse for the couple though when days later Katie spotted an insulting post written by Silvestri about the photos that had been shared on the Northeast Ohio Wedding Professionals Only Facebook group. 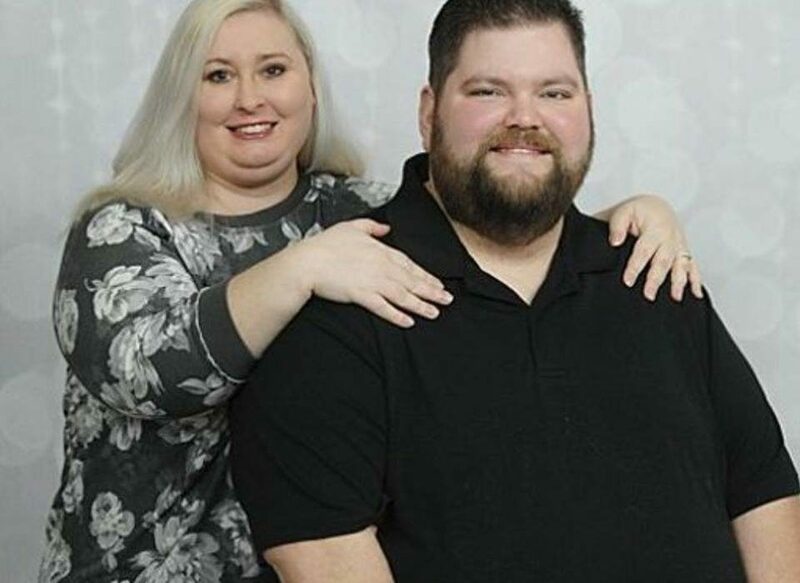 Last week I did an engagement session for a morbidly obese couple. Just from the way they were ‘picky’ about certain things during the session I knew they were going to be a PITA. It had DISASTER written all over it. She ‘loved’ the preview then picked apart the images once she got them. I wish whomever ends up with these two good luck. It is extremely difficult to get Pinterest worthy lovey dovey pics when people can’t even get their heads close to each other. First pic she was upset I gave her a chin tuck and the second pic was as close as their heads could get without straining. Seeing this post Katie and Jon became more upset and now they want their deposit back. I didn’t pay her $150 to have her make fun of me on a site. Silvestri told 5News Cleveland that she did refund Katie but stuck to her offer keeping the $150 deposit as the shoot took two hours. She eventually apologised for photoshopping the couple to make them appear thinner.